I have to start off by saying OMG I THINK ITS FALL!! I am sitting on my porch swing in yoga pants and a Patagonia listening to leaves swirling in the wind, and gee wiz this is perfect. Okay, back to the featured presentation. If you know me IRL (in real life, thank you Call Your Girlfriend) you know that I can be slightly obnoxious when it comes to organization and planning, especially for school. 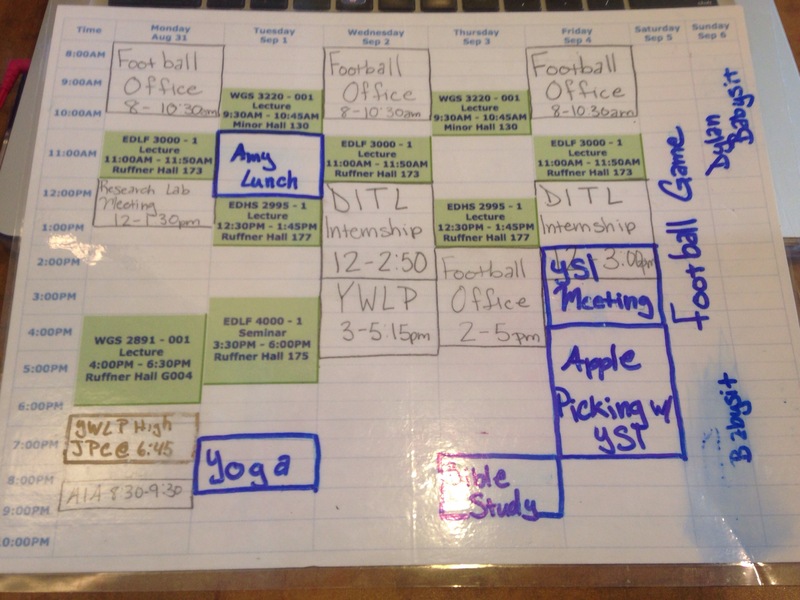 Going into our 4th week of school and my activities are definitely in full swing and I thought I would share some of my tactics for keeping everything straight! Of course we have to start off with my planner. Yes, is Lilly Pulitzer, and no I do not plan on every buying one again. It works just fine, but it is just too thick and takes up too much space in my bag. I carry my planner along with my “life notebook” everywhere I go, and it just too big. Anyways, all my homework assignments go in here, with activities and meetings on the top line. Its pretty simple, everything gets written down, and then it gets highlighted when completed, or dashed through if I didn’t get to it that day. 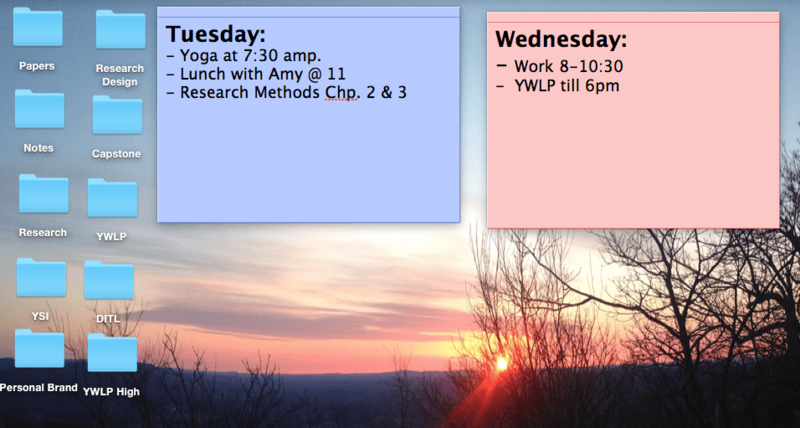 I typically do all my readings for the week on the weekends, which is why Fridays look so tight. Personally, I rather work really hard on the weekends so that during the week I can have time for my many activities or other weekly assignments. My desktop! I keep folders on my desktop to have easy access to all my notes, all the papers I’ve written or are currently writing, as well as way to categorize documents that are specifically for something I am involved with. For example, documents that relate to my major (YSI), or a current research project (YWLP High), or my Personal Brand folder that holds my resumes and cover letters in. The sticky notes have been a new addition to my organization “plan.” Because I do a lot of my work beforehand I use the sticky notes to remind me of what the necessities are for each day. This is just to make sure I don’t spend too much time on something thats due Friday and completely forget about whats due tomorrow. This one right here might be my favorite organization tool. I printed off my class schedule, wrote in my work and internship hours, along with other activities that happen weekly, then laminated it. Now, I keep a sharpie with me and simply write in other events I have throughout the week. It is a really nice illustration of what blocks of time I have open, so I can literally “pencil people in” my free time. Then at the end of the week I can take some nail polish remover and start over. If you use any of these four organization recommendations use this one, it is ridiculously helpful. 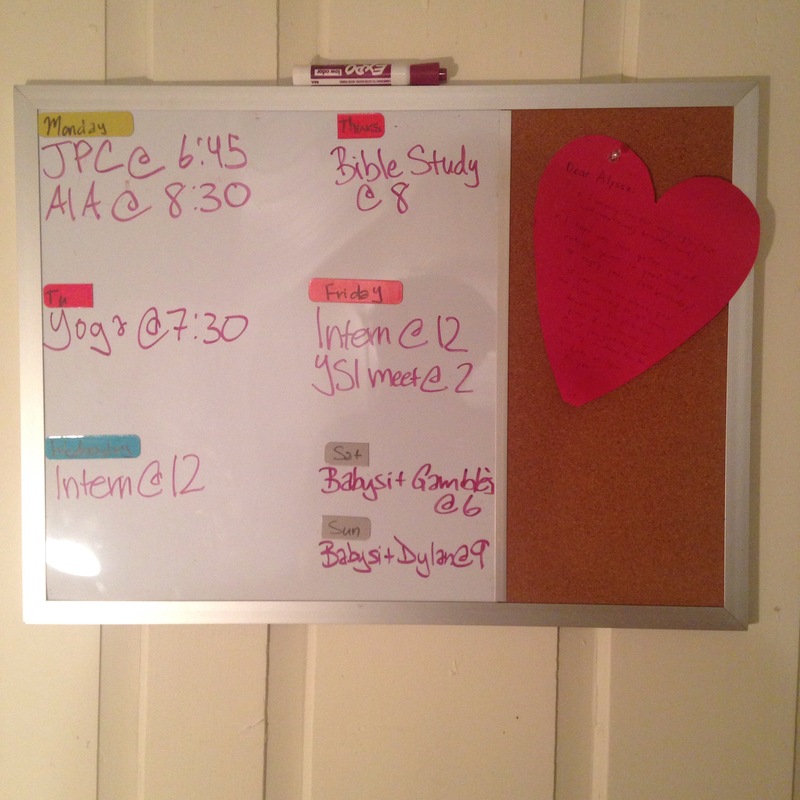 Everyone has their own ways of staying organized. I cringe at people who don’t use planners, but I mean you do you. I hope one of these tools could be helpful as you get in the groove of this new year, and I would love to hear y’alls own strategies for staying organized! ?